El Cortijo del Huerto forms part of a completely renovated, typical Andalusian farmyard. Hidden between plants and trees, it is situated at only 150 m from the magnificent beach of El Palmar. It has a lounge, an open-plan kitchen with dining area, a bathroom and one bedroom with double bed downstairs, and a bed gallery with two single beds upstairs. It is very tastefully decorated, in a modern and rustic local style, and fully equipped with microwave, washing machine, refrigerator, stereo, etc. It has a beautiful fenced garden with a small swimming pool for exclusive use of the guests. From the garden, you have beautiful views of the surrounding countryside. (For further info or to view the owner's website, please do not hesitate to contact the owner of the property). Conil de la Frontera: Conil is one of the most popular seaside resorts on the Coast of Light. On it's 7 mile coast, different types of beaches can be found : open and extensive, small coves surrounded by cliffs. Some of the characteristics of rural southern Spain can be perceived through rich agricultural small holdings. The architecture is alive reflecting fishing, trade, and the religious side of the town, thanks to it's preservation the town has been declared a historical artistic monument. Conil is rich in traditions, it produces craft work, especially pottery. The gastronomy is abundant from the fertile fishing and farming grounds. Vejer de la Frontera: This is undoubtedly one of the most beautiful towns, not only in Andalusia, but in Spain. It has been declared an historical artistic monument, and was awarded the'Premio Nacional de Embellecimiento'. Thanks to it's privileged location, on a hill 190 meters above sea level, it offers an amazing view of the surrounding countryside. The twisty narrow streets are a walk through the rich and varied history of this town. Particularly prominent is the influence of the Arabs who held the town for 593 years. Cape Trafalgar and Zahora: From the famous lighthouse of Cape Trafalgar direction north-east you arrive at the beautiful white sand beach of Zahora. Because of the lagoons formed at low tide, makes this a popular beach for families with small children. Lots of fun can be had snorkeling in the crystalline waters.This area is frequented mainly by nature lovers who come to enjoy the beauty and tranquility it has to offer. Cosy and comfortable cottage close to the beach, designed with much charm and style by Juan Antonio. Highly recommended, but please don't book it as well never get it again. Hasta la próxima Juan Antonio, muchas gracias. Muchas gracias Stephen y Familia..
Wij hebben genoten van een heerlijke week in El Cortijo del Huerto. Sfeervol en heerlijk rustig gelegen huis met prachtige ruime tuin en zwembad. Slechts drie minuten lopen van het fantastische strand van El Palmer. Hartelijke ontvangst door Juan Antonio. Aanrader! we had a very nice time in this house! Das Haus und die Lage sind ausserordentlich schön. Die Einrichtung des Hauses liebe- und geschmackvoll. Juan-Antonio ist sehr hilfsbereit und seine diskreten, unaufdringliche Art ist sehr angenehm. Er ist sofort da, wenn man ihn braucht. Der Garten ist gross und gepflegt, der Swimmingpool nicht gross, aber gerade richtig. Die Tiere im und ums Haus waren für uns eine schöne Nebenerscheinung, wir haben uns über das morgendliche Hallo der Gänse und Hähne gefreut. Und die Hauskatze Juana ist uns sehr ans Herz gewachsen. Wir hatten sehr schöne Tage hier. Einzig die beiden Matratzen in den Einzelbetten unter dem Dach sind nicht für Erwachsene absolut nicht geeignet, erst recht nicht, wenn man einen etwas heiklen Rücken hat. This was our second year staying as guests of Juan Antonio Cruzado and we have already booked a third. You could therefore say enough said! It suits us perfectly as we enjoy self catering and shopping at the local butcher and fish shop and going to the splendid market in Barbate for vegetables, where you can also sneak in some indulgent churros with your morning coffee. The cortijo is charming and very comfortable for 2 (+2). The location is perfect for walking to the low rise coastal resort of El Palmar, with it's fabulous beach stretching from Cape Trafalgar to Conil de la Frontera, every inch of which we have walked on one trip or another. The property is well maintained and you will never run out of eggs, which are a splendid feature of Juan Antonio's relaxed but perfectly attentive customer service. 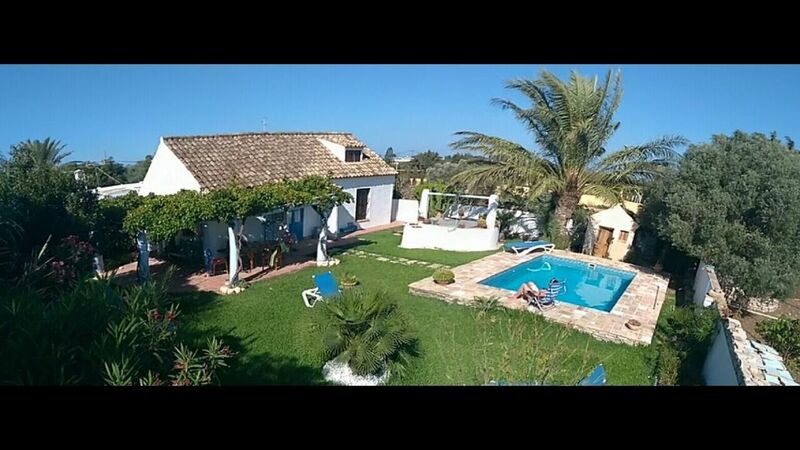 We have recommended the cortijo to people and indeed some friends of ours, who have their own property in Spain, were much taken with it when they came to stay one night, including an especially magical sunset at a nearby beach bar. We are especially fond of Gurugu Chiringuito on the beach, Restaurante El Alferez - the closest restaurant to the cortijo and Venta El Toro at Santa Lucia, just beneath Vejer de la Frontera. It is a real pleasure!! La propiedad esta cuidada con cariño y mucho detalle, el jardin y la piscina impecables. La casa cuenta con todas las comodidades y si surge alguna necesidad, el propietario, una persona muy amable y cercana, siempre esta atento y disponible para ayudar. A cinco minutos andando de la playa. Nuestra estancia ha sido inmejorable y si tenemos oportunidad, sin duda volveremos. Muchas gracias Elisa y familia...Un placer. Situated to the south of Conil, and close to the famous Cape Trafalgar lighthouse, making an 7 km stretch of white sand beach with crystalline waters, it is ideal for families, also considered one of the best beaches for surfers in Andalusia. Every year in March the national championships for surf are celebrated here. Along the beach front a great variety of bars and restaurants can be found, with superb local gastronomy. Amongst the rural residencial area small supermarkets and shops can easily be found. Minimum rental 1 week, in June, July, August and September 2 weeks (either the first or the last two weeks of the month). We can accept payments by bank transfer in Euro.